Bond yields are crashing in major markets all around the world as fears of a global economic slowdown have prompted investors to seek shelter in low-risk government debt. 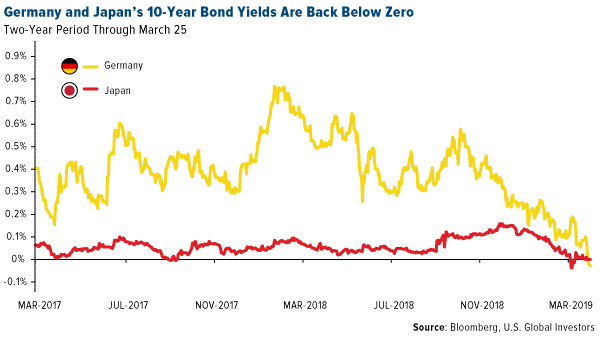 Both Germany and Japan�s 10-year bond yields are back below zero, marking the first time we�ve seen German yields turn negative since October 2016. As I shared with you last week, the pool of negative-yielding bonds around the globe now stands at a post-2017 high of $9.32 trillion. Yields in Australia and New Zealand have also fallen to record lows, according to Bloomberg. Here in the U.S., the yield on the 10-year Treasury has fallen to a more-than-one-year low on a dovish Federal Reserve. As you no doubt know by now, late last week, one very important part of the yield curve inverted for the first time since late 2006. On Tuesday morning, the 10-year Treasury was yielding 2.43 percent, compared to 2.46 percent for the 3-month Treasury�a small but meaningful spread of negative 3 basis points. 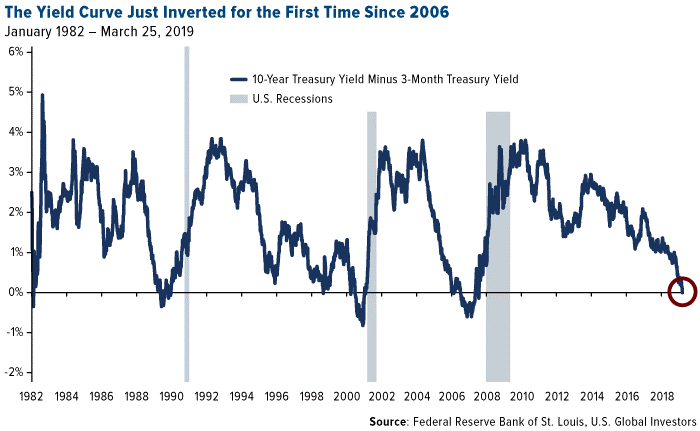 A yield curve inversion indicates that investors are anticipating a rate cut in the near future, which itself is a possible sign that economic growth is slowing. As such, inversions have been among the most reliable forecasters of recessions�at least here in the U.S., where each of the past seven recessions were preceded by an inversion. Take a look below. 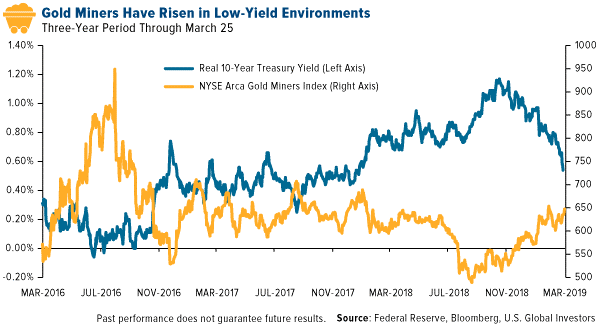 What the chart shows is the inverse relationship between gold mining stocks and the real 10-year Treasury yield��real� meaning inflation-adjusted. As you can see, gold stocks soared in the summer of 2016 as yields deteriorated and finally dipped below zero. But will yields turn negative? I can�t say for sure, of course. What I can say is that gold and gold mining stocks have historically been a good place to be positioned when economic fears pushed down bond yields. This is why I always recommend a 10 percent weighting in gold, with 5 percent in physical gold and the other 5 percent in high-quality gold mining stocks and funds. I like to call this the 10 Percent Golden Rule, and in the past, it�s helped investors stanch some of the losses they�ve experienced during economic pullbacks and equity bear markets. Unsure about how to get started? I recently appeared on Fox Business� �Countdown to the Closing Bell� with Liz Claman and shared with her my top three gold stock picks. In case you missed it, you can watch the replay by clicking here! All opinions expressed and data provided are subject to change without notice. Some of these opinions may not be appropriate to every investor. 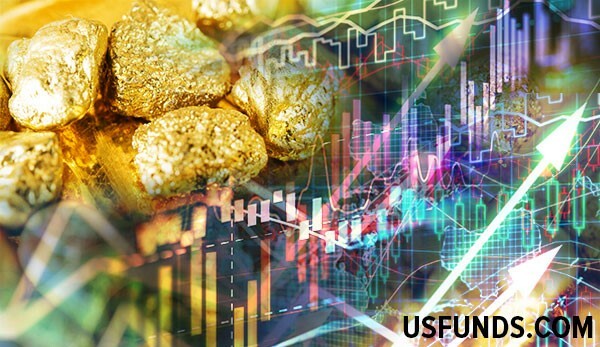 The NYSE Arca Gold Miners Index is a modified market capitalization weighted index comprised of publicly traded companies involved primarily in the mining for gold and silver. The index benchmark value was 500.0 at the close of trading on December 20, 2002. A basis point, or bp, is a common unit of measure for interest rates and other percentages in finance. One basis point is equal to 1/100th of 1%, or 0.01% (0.0001).